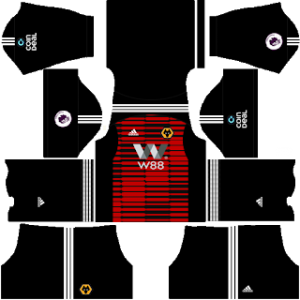 In this article, you can find and download Dream League Soccer (DLS) Wolverhampton Kits and Logos 2018, 2019 Edition with URLs. Wolverhampton is a professional team from England which competes in the English Premier League and other tournaments. The club was founded in 1877, 144 years ago. Wolverhampton is commonly known by the name of Wolves. Molineux Stadium is the home ground of the team, they play all the home matches at this stadium. The stadium has a capacity of 32,050 to withstand. Wolves were one of the first British clubs to install floodlights. Nuno Espírito Santo is the manager of the current Wolves team. If you wish to play Dream League Soccer with Wolverhampton kits, you can download it and easily install in the game and start playing. In Dream League Soccer you can change the kits and logos of your team. In order to do that you will need the URL of the kits to download. So in this post, we are providing the Dream League Soccer Wolverhampton kits and logo to download and play. The kits and logo are presented in the size of 512×512. You can use this kits in DLS by clicking the URL to download the Wolverhampton team home kit 2018-2019. You can use this kits in DLS by clicking the URL to download the Wolverhampton team away kit 2018-2019. 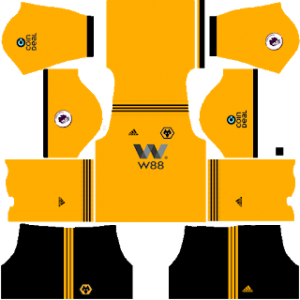 You can use this kits in DLS by clicking the URL to download the Wolverhampton team Goalkeeper’s home kit 2018-2019. 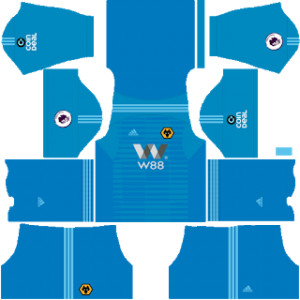 You can use this kits in DLS by clicking the URL to download the Wolverhampton team Goalkeeper’s away kit 2018-2019. You can use this Logo in DLS by clicking the URL to download Wolverhampton Logo 2018 – 2019.